hark Tank’s Season 6, Episode 9–which happened to be the show’s 100th episode–featured Storm Stoppers very own, CEO John D. Smith. John pitched Storm Stoppers beautifully! John began with a comical quip, comparing hurricanes to in-laws. He explains, hurricanes give you little time to prepare, and can leave your house a complete mess! To give an example, standing behind John is a cutaway of a house, and an alarm flashes as he presents: “Hurricane O’Leary is approaching!” the siren warns. John calls on Barbara to help him protect the house from Hurricane O’Leary, aptly named after Kevin O’Leary, the Shark. As John and Barbara slide utility gloves on, John explains that this very issue is faced by many people every time there is a storm warning. Home and business owners are forced to buy plywood, which is heavy and takes at least two people to lift, and mount the plywood over the doors and/or windows. John then brings out the Storm Stoppers 3/8″ original panel. Similar to the plywood, albeit much lighter, a DIY installer would simply line up the panel, push on the fastener and then take the mallet and tap it twice on each connection point. 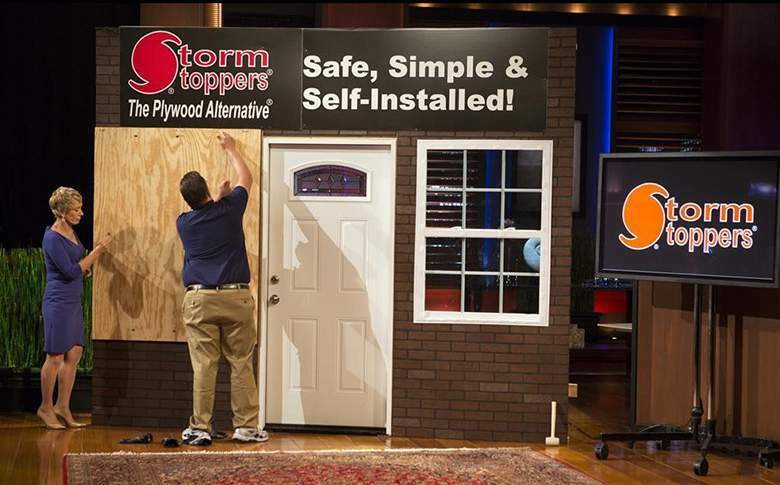 Storm Stoppers is a much easier to use alternative to the plywood method. How does it hold up in a hurricane simulation test? John then looks to the television behind him, which plays a video of a plywood protection method being easily penetrated by a 2×4 board. However, with Storm Stoppers, the 2×4 bounces right off the surface, and Storm Stoppers even protects the glass behind it (see Storm Stoppers 2×4 Missile Test video here). Robert then asks how the Storm Stoppers panel can be taken off and John points out that there are handles on the outside of the Storm Stoppers panel, which is useful for moving it around as well as taking it off, but there is also a second way; While everyone else bolts the product on, like the plywood method, if there was a fire, those inside would have great difficulty using the screwed shut exits. But with Storm Stoppers, you can push out the panel. John steps behind the cut-away of the house and pushes out the panel. While a deal is not struck, Barb admires the product and thinks it’s a good buy for any homeowner. She notes that the idea that in an emergency the Storm Stopper panel is easily removable is very attractive. Mark calls James an expert in hurricane safety and protection. Lastly, Lori reiterates the other shark’s position, stating that the Storm Stopper product is a very smart one indeed. Storm Stoppers are the first and only Safe, Simple and Self-Installed Storm Window & Door Protection product that is sold directly to DIY homeowners. Storm Stoppers are lightweight, install without screws or bolts and can be cut and installed without any power tools. Storm Stoppers panels let in lots of light and re-install in under a minute per window. Because Storm Stoppers do not bolt on, we are the only company in the industry to offer fast and safe exit from every protected opening. Get your Free DIY Quote today.